In music if you burst into the market with a classic you’ll make some quick bucks and it is likely your debut album will sell well even if it isn’t that good – making you even more bucks. – Release second song – almost always a “rockin’ fast” one that is boring and generic, but as you are “so hot right now” it will normally do OK and will probably chart 20 spots below the initial hit on name recognition alone. – Release third song – this time a soppy generic ballad and show your soft side. This works for either male or female, and if you look at Britney and Christina Aguilera’s various albums over the last decade plus almost all of them have worked this formula to the bone. But if the lead off single on any album blows, or if you release back to back duds, you’re pretty much done unless something dramatic happens – usually that means teaming up with whoever is “so hot right now” to put you back on the map – happens every year without fail. Beyonce did it this year with Mr GaGa, a dozen others do it with “insert temporarily famous rapper’s name here”. The movies are different, and they should be. Filmmakers don’t release albums, they don’t need filler material, every release is the EXCITING NEW SINGLE, if one out of ten stiffs no biggie, you can’t win ’em all. Two in a row, you’re in trouble. Three or more, desperation stakes. Five or so, turn me over: I’m done. M. Night Shamalamadingdong is a prime example of the one-hit wonder who wouldn’t go away, regardless of all the evidence that has stacked up over a decade now suggesting it was a massive fluke. The Sixth Sense was a once in a decade game changer, the equivalent of a “Like a Prayer”, “Enter Sandman” or “Crazy in Love” in the music world, a film that you immediately knew would go down as a classic and you’d be hearing it for decades. Those are just the first three songs that jumped into my head as incredi-huge – but look at the artists: Madonna, Metallica and Beyonce, fair to say they are household names even for non-music fans, more than a few million sales there too. At the time Shamalamadingdong was more than an exciting young talent, he practically invented the “twist-as-marketing” technique, which like the autotone in music is now incredibly overused and just annoying in 99% of situations. Now? Ding-Dong is battling uphill against a diminishing body or work that by all rights should have seen him drummed out of the industry – but he somehow keeps getting work! All I might say is that future producers watch any of his last 5 films before they greenlight another project. Unbreakable was good, but if that was the best thing you’ve done in a decade you might be better served looking at another career. But the fact is The Sixth Sense came first – and jokes aside it is awesome in every way, even now half a dozen viewings and full knowledge of the twist later. 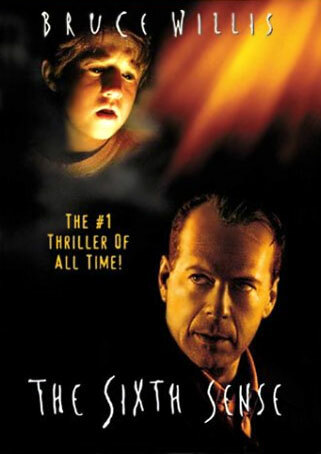 Once Cole Sear (Haley Joel Osment) commences dealings with child psychiatrist Malcolm Crowe (Bruce Willis) things progress a little slowly – and it must be said the film takes its sweet time building pace from there. Cole is a reluctant interview, he is troubled, shy and withdrawn, and generally* only comfortable while in close proximity to his single Mum Lynn (Toni Collette), and I must add an asterisk because this isn’t always true. Lynn is working two apparently minimum wage jobs and barely making ends meet before she even has time or energy to worry about her fragile young son. But worry she does, Cole seems a nice young lad but he is mentally anguished for reasons that he won’t reveal, he also sports bruises and scratches of unknown origin and occasionally panics for further reasons unknown. It must be said that regardless of all this Lynn is never less than 110% supportive – but she is simply out of ideas. Enter Malcolm Crowe, at their initial discussion Cole informs him “You’re nice, but you can’t help me”. But Malcolm won’t give up, there are more meetings at various locations, until finally after a “happening” (a way more effective one than the crappy one Ding-Dong subsequently decided to build an awful film around) Cole finally decides to open up to Malcolm… in a way that has since been parodied and sent up on no less than 1,067, 213 occasions in film, TV and print. For the one guy who hasn’t seen this yet I’ll leave the plot there. The Sixth Sense is not scary aside from a couple of jumps, at least I thought so. My wife watched it many years ago while I was away and then spent the night awake with the light on afraid to move. It is immaculately and brilliantly crafted though – as multiple viewings will reinforce – and takes painstaking care to remain plausible and effective. There are three or four scenes and moments, even before the reveal, that create tingles almost every time I watch it. One of them involves the always effective hissing tape reel that Session 9 also utilized well. One last point before summing up The Sixth Sense, it features an early appearance of a very young Mischa Barton as a “vomiting child” who reacted poorly to something she took, if we are to believe what we read she has been method acting this same role throughout her teens and twenties – she probably weighs less than she did in this film too. Regardless of the increasingly mediocre output that has followed, M. Night Shyamalan can always point to The Sixth Sense and rightfully argue that he has made something that will stand for always. Bruce Willis is excellent as Crowe, Osment a revelation as Cole and aside from an annoying yet authentic accent Collette does a great job as the “at wit’s end” Lynn. Final Rating – 9 / 10. The Sixth Sense has a great build, and excellent mid-section and a killer end. Read that sentence again: that’s my third Beyonce comparison in the same review! This entry was posted in Bruce Willis, Film, Great Movies, Movie Reviews, OGR Recommends, Worthwhile Movies. Bookmark the permalink.